Product prices and availability are accurate as of 2019-04-20 19:40:24 UTC and are subject to change. Any price and availability information displayed on http://www.amazon.co.uk/ at the time of purchase will apply to the purchase of this product. 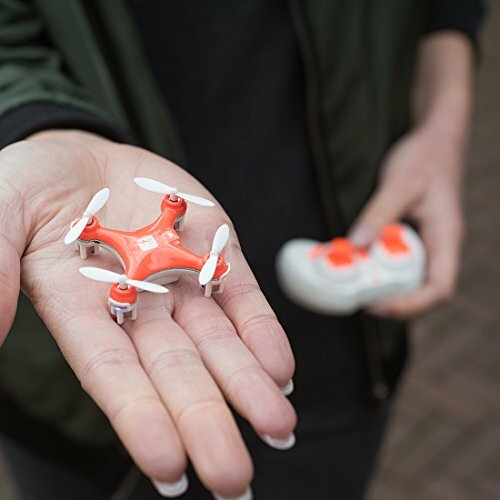 Throw and Fly: With its feather-weight design and powerful motors, the SKEYE Nano Drone from TRNDlabs can literally leap into the air with a toss from your hand. Just throttle up, and let the ready-to-fly technology do the rest. Whether you've never held the sticks before or you're an expert pilot, you'll be impressed with what this little baby can do. At 4.0 x 4.0 cm and weighing 11.9 grams, you've never been at the controls of such a nimble yet stable quadcopter. Start with low gyro sensitivity just to get the hang of it, then gradually switch to maximum sensitivity and guide your Nano Drone in the kind of aerial acrobatics you haven't seen from a quadcopter at this price point. 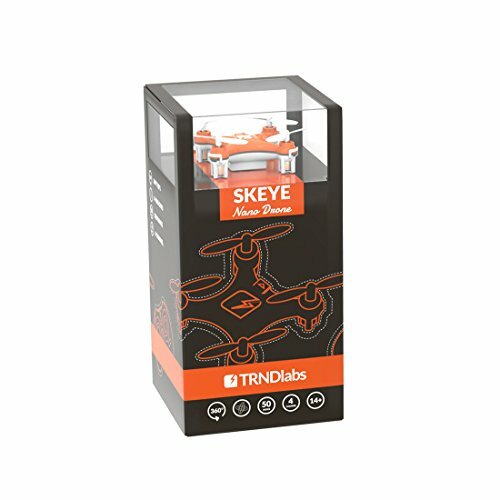 Sophisticated circuitry, piezoelectric gyros, and accelerometers give the SKEYE Nano Drone outstanding stability. You can even throw it in the air while throttling up, and it will automatically stabilize! Since the Nano Drone uses a direct controller rather than an app, you can fly it with far more precision than larger, more expensive models. Zip it around your living room, or take it outside on a calm day, and feel the responsiveness as you bank, barrel roll and even flip your quadcopter. After just a few minutes behind the controls, you'll know just how much fun flying can be. Thanks to onboard LED's, you can even take it out and light up the night! Its three flight levels make the Nano Drone an excellent beginner model. So whether you're learning to fly yourself, or you know someone who'd love to, this is the way to do it - with a small but speedy quadcopter that doesn't cost a small fortune. 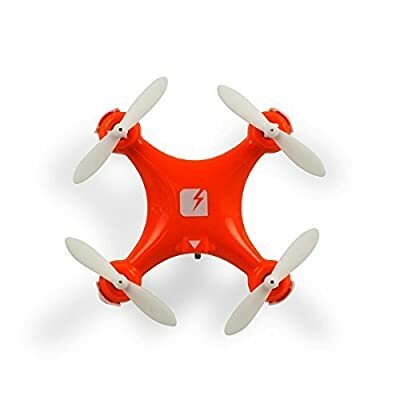 Get Some Air: With quality construction, elegant controls and a one-year hardware warranty, the SKEYE Nano Drone is making its mark in the micro quadcopter market. Ready to take the sticks? Want to give a friend or loved one the chance to do some extreme precision flying? Order yours today! LEARN TO FLY: With three flight modes, the SKEYE Nano Drone is a dream to fly for beginners and experts alike. With its own elegantly simple control system, this quadcopter instantly responds when you move the sticks. 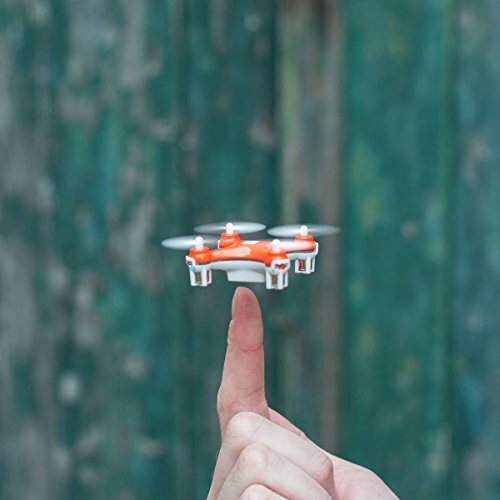 Let go, and the Nano Drone immediately returns to a solid and steady hover. FLY INDOORS OR OUT: At 4.0 x 4.0 cm and weighing 11.9 grams, the Nano Drone can deftly maneuver in and around the tiniest nooks. This makes it great fun for indoor flight, but thanks to six-axis stabilization, you can also cruise it around on a relatively calm day. LED lights even make it possible to fly at night. PRECISION MANEUVERING: Once you've got the hang of the controls, turn up the sensitivity level to pull off spectacular maneuvers you would have never thought possible from such an affordable quadcopter. Thanks to its sophisticated circuitry, piezoelectric gyros, and accelerometers, this tiny machine exhibits incredible stability while in flight. PRODUCT PARTICULARS: In addition to the SKEYE Nano Drone and its 2.4GHZ, 4-channel controller, we include a 3.7V 100mAh LiPo battery, USB charging cable, rotor protection guard and 4 replacement rotor blades. All you need to add are two AAA batteries for the controller, and you'll be ready to fly. Charging takes 30 minutes, and we've optimized the software to give you 7-8 minutes of flight time on each charge. You'll be able to control your Nano Drone from up to 50 meters away. FLY WITH QUALITY: At TRNDlabs, we take the time to ensure each product we sell meets our stringent standards for quality and durability. The Nano Drone is no exception. Plus, we include a one-year hardware replacement warranty. Simply contact us, and we'll send you a new drone that is at least functionally equivalent to the original. That's doing business the TRNDlabs way. Ready to perform some aerial acrobatics? 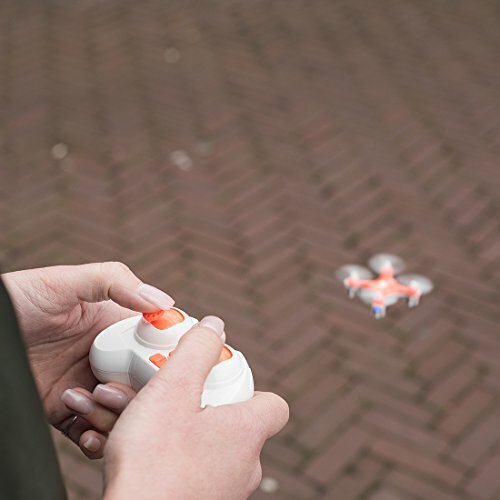 Order your Nano Drone today, and see what happens with your hands on the sticks!